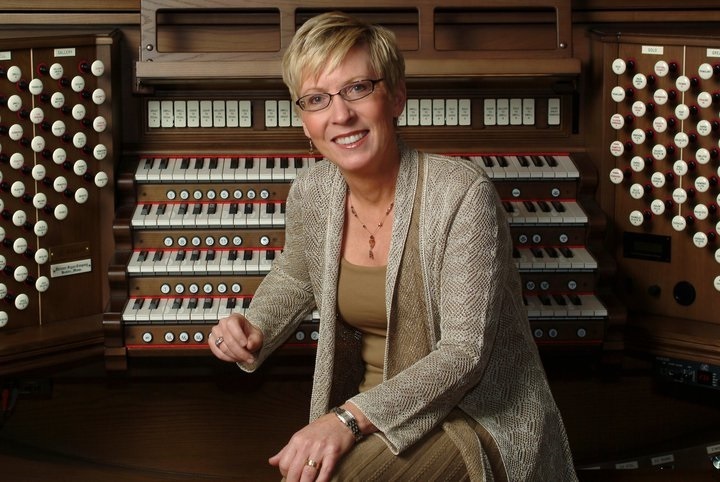 Olivet Nazarene University presents Dr. Jane Holstein on the the Ovid Young Memorial Organ Recital Series. JANE HOLSTEIN (b. 1958) has served as editor with Hope Publishing Company for two decades. She is busy as an arranger, clinician, organist, worship planner, and concert artist, residing in Wheaton, Illinois, with her husband, David L. Weck. Jane is a graduate of Olivet Nazarene University, Kankakee, Illinois, and later received a DM in Organ Performance from Northwestern University, Evanston, Illinois. Besides serving as an editor with Hope, where she directs all of their choral, keyboard and instrumental publications, she is active in church music as organist/choral director as Director of Music Ministries at First Presbyterian Church in River Forest, Illinois. Jane was an integral part of the editorial team that compiled Hope’s latest hymnal WORSHIP & REJOICE (2001). Hope has published numerous collections that Jane has compiled and edited including CLASSIC SOLOS FOR FLUTE AND KEYBOARD, EASY ANTHEMS, vol. 1-6, WOMEN IN SONG, vol. 2 & 3, and WORSHIP OPENERS, vol. 1-3. Her latest keyboard compilations include THE ESSENTIAL COLLECTION FOR THE CHURCH PIANIST, and THE ESSENTIAL COLLECTION FOR THE CHURCH ORGANIST, vol. 1 & 2, THE WEDDING ORGANIST, I HAVE HEARD YOU CALLING IN THE NIGHT (piano), and her newest hymn collection entitled HYMNS OF PROMISE (200 hymns and songs). As a gifted concert organist, Jane has joined forces with Joel Raney for a series of duo-concerts featuring the piano and organ in an innovative Keyboard Excursions, exploring a variety of styles in sacred and classical music.